Beardy greek mashes his keyboards once more to produce an enigmatic work with a guest appearance from Jon “Yes” Anderson. Years ago Carl Sagan did a TV show called Cosmos (the soundtrack to which has already been covered here). It told us all what we knew about the solar system and featured stunning imagery which inspired many young people to get interested in astronomy. Thirty-odd years later, the astronomy factory’s failed to surface and the teacher saying “Astronomy is full of maths” was the right thing to say to impressionable lazy young people embarking on their first tentative steps into the real world. While I was saved a failed career in astronomy thanks to that warning, I carried a little piece of Sagan’s masterwork in my memory, that of the theme tune. A tune that brought to mind black and white portable television sets and eager cassette recorders waiting to catch the music from the final minutes of the TV show. Years later, while searching for the music, I learned that the tune was actually from Vangelis’ work Heaven and Hell. While tempting to skip through to the actual bit from Cosmos the album is actually worth listening to in its entirety. Especially as near the end of the first side, our favourite high pitched male singer, Anderson, pops up with an outer space lyrical coda to the side. Indeed, I believe this is the album upon which Vangelis and Anderson worked before forming their own double act, the imaginatively named Jon & Vangelis. Of course, if you have been following this project for the several years it has been running you might also recall that Vangelis was a member of Aphrodities Child which also dabbled in Biblical musical imagary, with their album 666. This was another of the first CDs I bought for my first CD player and I played it over and over and over. Chris Rose, a boy at my school, was also a fan of the album and we would spend free periods in sixth form discussing the album, the film Maltese Falcon and Dashiell Hammett. We fostered a good friendship through the two years we were in sixth form together solely based on him seeing the albums title written on one of my cassettes while I was reading the book Maltese Falcon listening to the album on my Walkman. The song from which the album takes its title, Friends of Mr Cairo, is a tribute and nod to the film noir genre made famous by the likes of actors such as Humphrey Bogart, Sidney Greenstreet and Peter Lorre, Mr Cairo being a character played by Peter Lorre in the film Maltese Falcon. This is Jon and Vangelis’ “difficult” but popular second album. Look hard and long at Vangelis’ catalogue and you’ll struggle to find this album. Probably because it is an unofficial compilation. If you were about in the 1980s you’ll probably recall a ground breaking documentary series called Cosmos presented by Carl Sagan. You’ll also probably remember the futuristic music that accompanied the series, most of which was extracted from albums by Vangelis. Indeed, if you are British, you might remember Johnny Ball’s informative television programmes covering numbers, science and the like. You know, from the time when television programmes weren’t vacuous? Well there are a few tracks on this album that will bring memories of those times rushing back. This album is a collection of Vangelis’ most overused tunes from various science programmes throughout the eighties nicely tied under the title, Cosmos. Two titans of prog meet and out prog themselves with prog in a very pro-prog kind of way. Jon Anderson of Yes joins forces with Vangelis of Aphrodites Child to forge an unholy progressive rock alliance bringing the auditory senses an extra dose of twee, sax and plinky plonky synth. I used to really like this album when I was younger. I had it on CD, then on tape and just to be format friendly, nicked it off the internet. I think by the third time I had obtained this album, I’d already overspent. Sure, its a good album if you’re a fan. But it’s certainly a product of the time. Just too twee. You half expect to sprout a kaftan and start waving a smudge stick about the place while sticking up Roger Dean posters everywhere just by listening to it. Great if you like Greek blokes with beards and mop haired guys from Altrincham with inexplicable American accents. 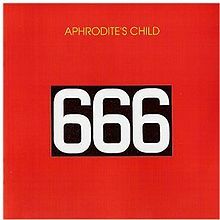 Aphrodite’s Child is to Greece what the Beatles are to Liverpool and Abba to Sweden. If Greece had maintained such quality progrock output I suspect they wouldn’t be in financial difficulty now. Though what do I know about economics? Stuff all. I suspect most of you will not have heard of Aphrodite’s Child (AC) but I’m certain you may be aware of two of the lead members: Vangelis and Demis Roussos. 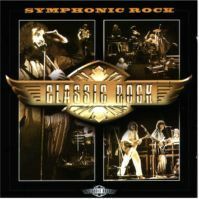 The band was a product of a time when Prog was popular in the west – long before punk appeared. With a style similar to the Moody Blues, AC only managed to churn out 3 albums. 666 is the last AC album before they split to pursue solo projects and is a concept double album based on the bible’s Book of Revelation. I’ve only ever attempted to listen to the album all the way through a couple of times. It’s quite hard going but there are a couple of sections that stir up desires and send prog infused shivers to your toes via your spine. These being most notably The Four Horsemen and Hic and Nunc If you know the works of Vangelis and Roussos you would probably listen to it blissfully unaware of who you are listening to, this album being so detached from their later styles. 1. Take the room, heat to unbearable sweaty levels. Sit in the room. On a cushion. Wearing your kaftan with your beard and similarly attired friends. Stuff the largest cushions up your kaftan and encourage your friends to do the same. This is to increase your girth and make you at one with Roussos, Sideros and Vangelis. 2. Douse each participant in the strong aftershave and apply the chest wigs (if you are doing this on your own because you have no friends, use all three chestwigs for full appreciation). Repeat until fumes effect visibility or motor functions. Ensure all participants have worked up a really big sweat. 3. Partake in the drugs and metaxa. Cannabis is recommended here as you can usually get a good hit if you use a hooka pipe which will also add to the authenticity of the experience. Other drugs can be used but may effect the overall experience detrementally (especially crack or crystal meth). 4. Play the album and nibble on mezze board. 6. Halucinate and sway about.